I'm thinking of getting a photo album but surprisingly 3.5 x 5" ones are incredibly rare, unless I'd want a huge one that stores 300 which is overkill. How do you store or display your Idol pics and post cards? But i'd be curious to see how else people would display them, as I have a lot of photos just sat in boxes atm. Can you elaborate what you mean by "the photo albums"? Do you mean you're putting them in the typical 4x6" photo pages in a 3-ring binder? Thanks for sharing. And yet even the link you provided their slip-in photo albums only support these sizes:6x4", 7x5", 6x4.5", 8x6", 9x6"
The 'L' sized H!P photos are 3.5x5". I'm guessing your'e getting the more 'standard' photo size holder (6x4") and you just have extra space around the edges of the L-sized photos, yes? I actually went ahead and ordered something from another place and I'll share it once it arrives so you can all see how it looks. I'm not a regular photo collector, but I just had to get the photo set from LILIUM and then a few from my favorite Angerme video. I thought if I put them in a nice album, maybe I'll want more lol. First time in Japan and first time buying photos, so many photos... my temporary solution to bring them home is a plastic box I got from the 100yen store. I am currently wrapping everything in my Suzuki towels. When I get home then I will take it from there. I have (most) photos in a small box. Some I have are bigger, but they just sit on top of the box (sealed in their personal sleeves though, so protected from dust. But I want to do something more to properly store them. Ok, so here's what I got to organize my small collection. I really like the idea of black backgrounds vs clear so I went with Print File and ordered a small album size (I believe its actually their medium). I didn't want my album to be a full paper sheet size because the spines and up being close to 12" high and I want to have this album with my Jpop DVDs. What do you all think? These pages have the 3.5 x 5 " size pockets I was looking for. Nicley done hanawopun! I am going to order two faily large albums from Amazon. I don't care about them looking fancy because I can't afford that at them moment, I just want a lot of storage space. Will show my result once I have ordered and bought them. ^ Great! I look forward to seeing. DC Factory: The images with this label have been sold on the e-lineup and at concerts. With the Lilium images having this lable I guess they sold them at the e-lineup and most probably also at the musical venue as well. I picked up my image at Zukki's Budokan, but you could also grab them online. On the e-lineup you find concert goods such as towels, kingblades and t-shirts. 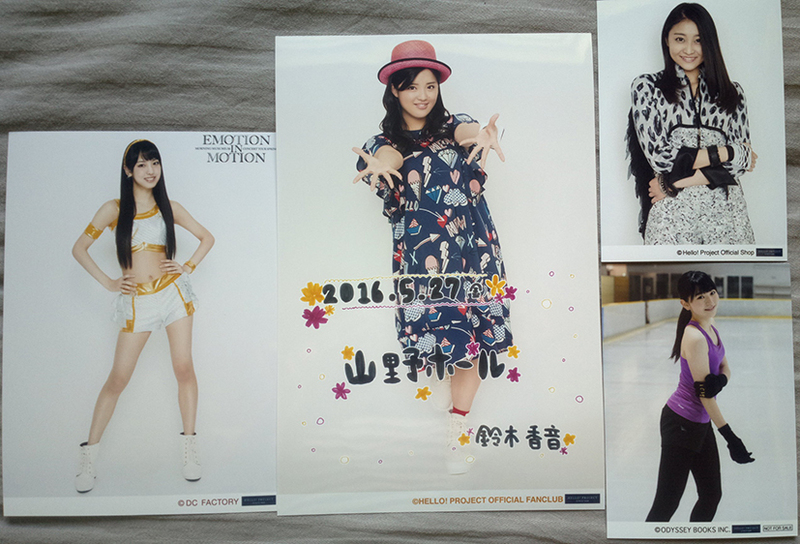 Hello Project Official Fanclub: Limited images for fanclub members to buy. Often related to special things such as Birthday event pictures + dvds and event v dvds. You can order them on the site if you are a member or buy them at the event. The image in the picture was from Zukki's last fanclub event and the image was bought at the event. Hello Project Official Shop: Sold in a hello project store. There are several and I have only visited the one in Akihabara (Tokyo) and the one in Nagoya. In the stores there are hundreds of pictures to buy, you can use a store site to see what they have in stock and prices before you go. You can also use a different site to buy the things online. The photos sold in the H!P shops are not the same as the ones on the e-lineup, but they do sometimes have the same theme. Odyssey Books Inc: This one is a little special. I got it as my bouns when I bought Ogata Haruna's greeting photobook. You had three images to chose from and you can only get them by buying the book. I guess that it has the same label as the phopobook printer, but I can't say for sure. The e-lineup also sold the book but I am not sure if they used the same pictures. International fans can order from the e-lineup and there are ways to buy things on Yahoo auctions. Most fans who want photos join Idol!Swap, a facebook group where people sell mostly photos but other H!P things too. It is run by Alita who lives in Tokyo and goes to venues/H!P shops to buy things and orders things from all the sites. Fans also have auctions of old things such as dvds, photobooks, old photos and more. ^Very true! Sadly Tokyo ruined Idol!Swap a bit for me since everything is so much better there. I found so many trading cards and cheap albums. I wish I had been allowed to have two luggage bags lol. But as it is and I!S is still great of course. On topic I have ordered a L album and a 2L album. not as cheap as I wanted because I decided that I wanted them in a different color. I hope I get them next week. ^I can't say my parents were pleased about me going off on my own. My father expressed while drunk afterwards that he was not happy at all... Tokyo is the perfect place for iol things, but since so much exists the temptation is huge, that way Idol Swap is better since it is easier to limit yourself. Amazon says the albums will arrive on Thursday, I am 99% sure they will be wrong.